KATHMANDU, June 11: Federal Socialist Forum Nepal (FSFN) and Naya Shakti Party Nepal (NSPN) have urged the agitating Rastriya Janata Party Nepal (RJPN) to participate in the local polls to safeguard the achievements of the Madhes movement, including federalism. Issuing a joint statement on Sunday, FSFN Chairman Upendra Yadav and NSPN Chairman Dr Baburam Bhattarai appealed the agitating parties to capitalize on the local elections to foil regressive attempts and to institutionalize the achievements made through various political movements in Nepal. “We would like to appeal to all the agitating political parties including RJPN to institutionalize federalism and to foil the anti-revolutionary plot by capitalizing on the upcoming local level elections,” reads the joint statement. The statement further said that the FSFN and NSPN will continue their alliance in the second phase of local level elections as well, while keeping door open to bring other like-minded parties in their alliance. 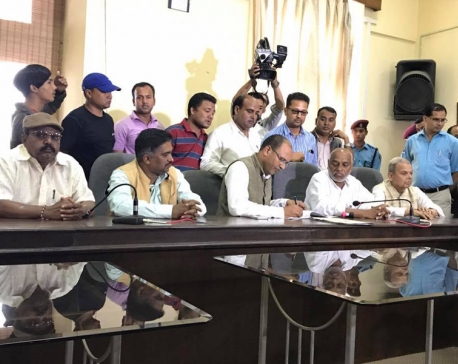 The two parties have also asked the government to create conducive environment for polls by implementing the agreements reached with various agitating parties, releasing political prisoners, withdrawing fake court cases and providing compensation to the victims of the recent Madhes uprising at the earliest.